This is to remind members that the FBU, in partnership with Islington TUC and Hackney TUC, has organised two marches and a rally on Saturday in support of Clerkenwell and Kingsland fire stations, both of which are threatened with closure. Flyers for the marches can be found below. The Clerkenwell march will assemble at Highbury Fields (near the tennis courts) from midday. The Kingsland march will assemble adjacent to Kingsland fire station, also from midday. The marches will converge en route to the rally, which will take place at Spa Fields, Clerkenwell from 2.30pm. 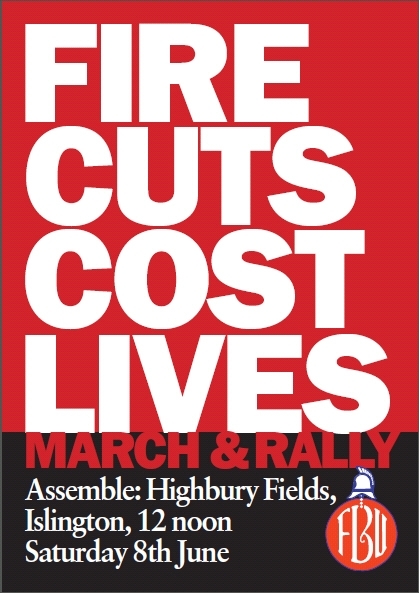 Speakers at the rally will include FBU general secretary Matt Wrack and Labour GLA member Andrew Dismore. We urge members to attend this important event. Families and friends are welcome. 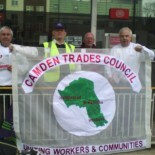 This entry was posted on June 5, 2013 by CAMDEN TRADES COUNCIL.